When I lived in the United States, I used to associate weather with what activities I can do outside for the day (take a trip to the park, go for a run, etc). Since I’ve moved to Indonesia, I have made a new association with weather. LAUNDRY. When it’s a sunny day, I instantly think about how many loads I need to wash and whether I have enough drying rack space to dry all my laundry for the day. When it’s a rainy day, I gloomily think about my laundry that is piling up and then anticipate the next day’s weather. When I hang my laundry, I often think about my friend who had lived overseas for a number of years. 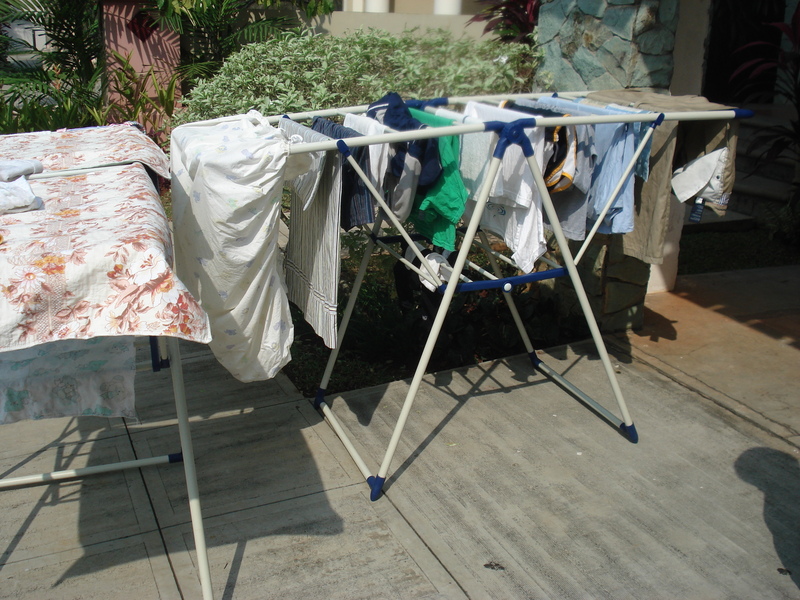 About a month before coming to Indonesia, I was telling her about my woes about not having a clothes dryer in Indonesia, but she assured me that she learned to love drying her laundry without a dryer for the following reasons: it’s green; it saves money; and it makes clothes last longer. I gawked at her as I thought about the crunchy towels and the stiff clothes I’d have to put on my children. I dreaded the time it was going to take to hang every article of wet clothing as opposed to just throwing everything in the dryer. However, as I have gotten accustomed to life here, I realize that my friend was right and I was just being a narrow-minded drama queen. Actually, hanging laundry is now strangely quite soothing to me. Each morning as I’m hanging my laundry, I have about ten minutes of alone time (even if I’m not completely alone as my son runs around), when I can enjoy the morning air, hang laundry, say hello to neighbors and, most importantly, thank God for teaching me that what I knew as the best way of life was not necessarily the best. And then I wonder: what are some other habits or perceptions I have that need to be changed for the better? I’ll keep thinking…gotta go hang some laundry!